Q: How can I make the menu bars bigger in PDF Studio so that they are easier to use with the touch screen on my Windows Surface? A: The Menu bar font sizes in PDF Studio are set by the settings of your system. You can change these settings on your system to either make it easier to read or more easily accessed using a touch screen. To do so just follow the directions below. Log on to the Windows 8/Windows 8.1/Windows 10 computer with any user account. 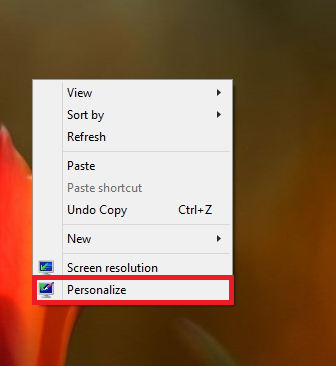 From the Start screen, click the Desktop tile. From the displayed context menu, click Personalize. 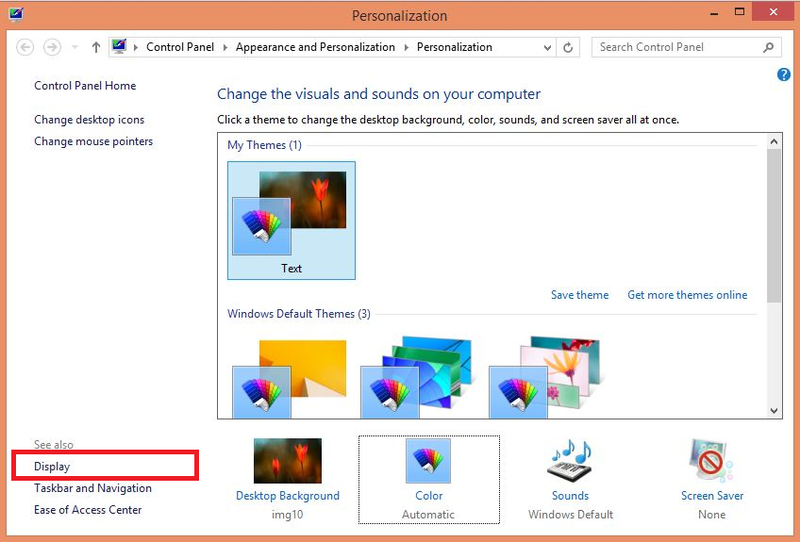 On the opened Personalization window, click Display from the navigation bar in the left pane. 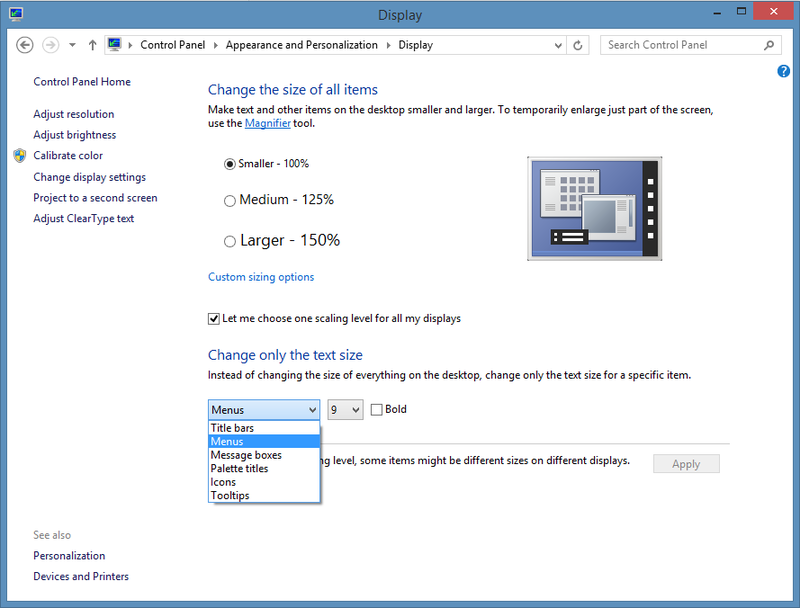 From the Display window, under the Change only the font size section, choose the Menus option from the object’ drop-down list. 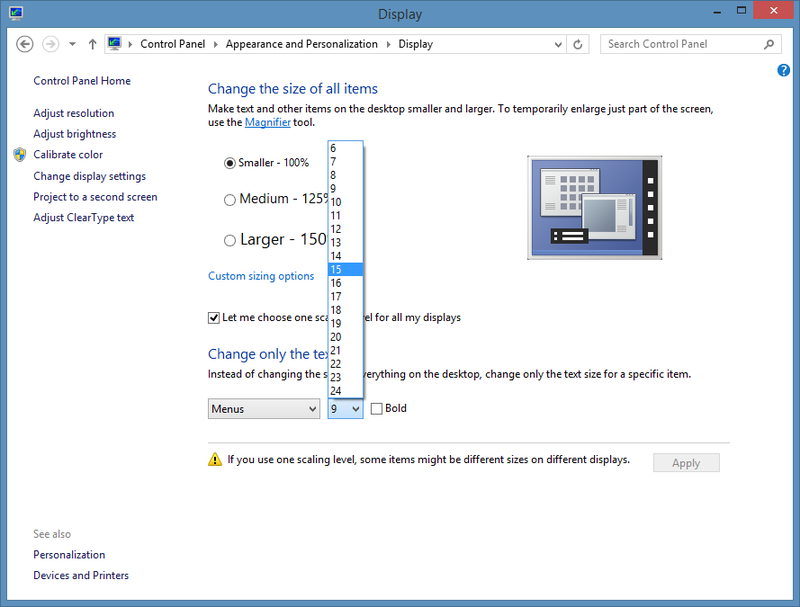 From the size drop-down list, choose the appropriate size for the menus of the operating system. Once this is done, click Apply to allow the changes to take effect. Optionally, you can also choose other objects such as title bars, message boxes, icons, or tooltips from the objects’ drop-down list, and choose the appropriate font size for them from the size drop-down list as well. **NOTE: This will update the menu bar sizes on every application using the windows theme which will actually help to make using the touch screen on your other applications as well.